Hybrid technologies help distribute power in isolated communities. When William Igkurak was young, his father built a windmill near the family home in Kwigillingok, an Alaskan village perched on a paper-flat patch of tundra at the edge of the Bering Sea. The village — affectionately known as “Kwig” — had no electricity then, but the little mill charged a battery that powered a single light bulb inside Igkurak’s home, providing comfort through the long winter darkness. 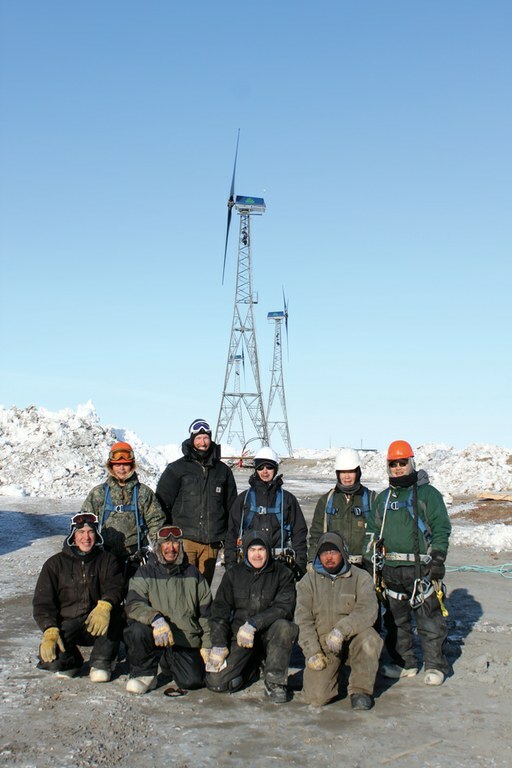 Wind turbine technicians in Kwigillingok, Alaska. Today, powering the 350-resident village is still challenging. Igkurak has helped provide heat and electricity as manager of the local utility, Kwig Power Co., for 31 of his 64 years. Eighty miles from the nearest road, Kwig is too remote to connect to a central power grid. Instead, it has its own grid, powered by two diesel generators. Some 200 other rural Alaska villages rely on the same approach. The fumes foul the air, and as fuel prices climb, the villages face the nation’s highest energy bills. But the five 100-foot-tall wind turbines recently erected near Igkurak’s office hint at a possible solution to rural Alaska’s energy crisis. A combination of state and federal funding, as well as private investment, has helped a new breed of cleaner energy take root: small hybrid renewable systems that use wind turbines or solar panels to reduce diesel use. Kwig began its own renewable energy endeavor a decade ago, working with three other villages in southwest Alaska to form the Chaninik Wind Group. With help from Anchorage-based Intelligent Energy Systems, the villages raised $12 million and built a total of 15 wind turbines. Since their debut in 2012, the new wind-diesel systems have displaced 30 percent of the fuel used for electricity, an amount that Dennis Meiners, the company’s project manager, says will increase to 50 percent after new batteries are installed in all the villages. At the same time, excess wind is being harnessed to run new electric heating units that Meiners’ team is putting in people’s homes. Some locals spend as much as 50 percent of their income on diesel for heating; it retails for up to $7 a gallon, and each gallon provides heat for only one hour. Unlike electricity, it’s not subsidized by the state. Although the Chaninik project is still in its infancy, Meiners sees huge potential for similar systems throughout Alaska. Currently, two other villages have high penetration wind-diesel systems in place, but far more could benefit. When solar resources — better suited to the Alaskan interior than wind — are factored in, he estimates half of all Alaskan villages could be powered partially by -renewables. Integrating new sources with diesel generators is still challenging, says the National Renewable Energy Lab’s Brian Hirsch, the former energy director for the Yukon Intertribal Watershed Council, a nonprofit group serving 70 tribes and First Nations in the California-sized Yukon River watershed. But the increasing availability of much-improved smart grid technology has helped make it easier to ramp generators up and down in sync with fluctuating sun and wind. 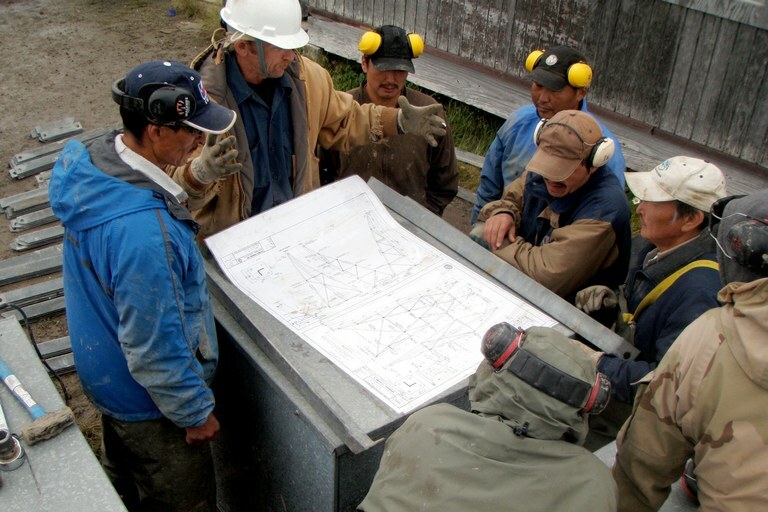 technicians from the Chaninik Wind Group villages discuss plans for a wind power project in Kwigillingok, Alaska. Alaska Sens. Lisa Murkowski and Mark Begich have begun talking about their state as a testing ground for energy systems that could be exported to other “islanded” communities around the world. Russia alone has 2,000 diesel-dependent villages. Developing countries like Nigeria and Indonesia, which Hirsch recently visited, are also filled with them. Temperatures aside, the similarities to Alaska were astounding, he says. Obstacles remain, however. In a place as isolated as Kwig, if something breaks, getting it fixed or ordering a replacement costs a lot more, says Igkurak. Worse, much of the $250 million provided by the 2008 Alaska Renewable Energy fund is going to high-cost, low-impact projects rather than to broader efforts that could lower bills for more people, such as energy-efficiency programs. Still, Kwig has undeniably benefitted. Igkurak was able to shave 10,000 gallons off the village’s usual 80,000 gallon diesel order — saving $45,000. That means he can raise salaries and provide better benefits for his nine employees, as well as pay for badly needed maintenance on the old -generators.